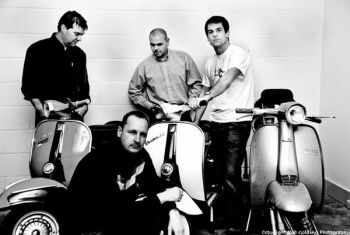 Gloucestershire has a new mod revival-inspired band by the name of The Q. The four-piece (Shane on drums, Rob on bass, Mike on guitar/vocals, and Tim also on guitar/vocals) deal in melodic, catchy power-pop very much in the mod tradition of The Jam, The Chords and Secret Affair. Their song ‘Through Your Eyes’ has a stomper of a chorus, destined to be belted out like any classic anthem you choose to name. Meanwhile ‘Interlude’ is a more subtle take on inner-city strife, with the same classic ’79 sound as before. Recently released debut EP Issues was produced by none other than Vic Coppersmith-Heaven, best known for his work with The Jam. It has been released by German label Time For Action, on 10″ vinyl and as a download from ITunes. You can hear the band on their Myspace page here and their website here.